For a completely unique dining experience visit the Tower of Americas. 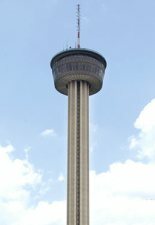 The 750-foot-tall Tower of the Americas has offered tourists of San Antonio, Texas, the most breathtaking view of the city. Visitors to the Tower may dine at the Tower’s revolving restaurant or enjoy the scenery from the observation deck. The restaurant serves a wide variety of dishes at moderate prices all within the upscale restaurant located at the top of the tower. Reservations are highly recommend. The food is delicious and service is good.